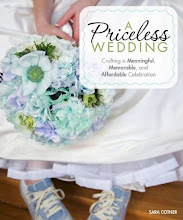 I adore this post (not just because a) Pickle is an utterly and completely adorable little boy and b) I love the name Pickle because it reminds me of my little Piglet) but also because it talks about the hard stuff of marriage--how to bring together pre-existing families--in a very optimistic and upbeat way. This title is taken from the name of our Pre-Cana classes (which couples have to take to get married in the Catholic Church, and which is another story all together), but I am using it to refer to the three people in my marriage--me, my husband Socrates, and his 6 year-old son, Pickle. Ever since Socrates and I moved in together a year before our engagement, we have told Pickle that we are a family, and that he is so lucky to have so many people in his family who love him, which included all the members of my family. 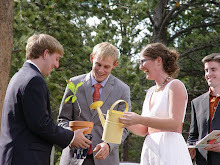 So when we got engaged Socrates told him, “Sanyamakadi is going to be part of the family now,” he was confused, saying, “But she’s already part of the family.” Pickle was very excited about the wedding and thought that we were all getting married. He would ask, “Can one girl marry two boys?” When we said no he would ask worriedly, “Then how can we both marry Sanyamakadi?” Our go-to explanation became that Socrates and I were getting married, and because he, Pickle, was part of Socrates’ family, when Socrates and I got married and became a family, he would be part of that family too. 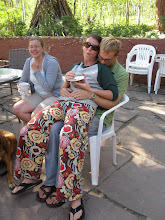 During the planning process we thought a lot about how to involve Pickle in the wedding day. 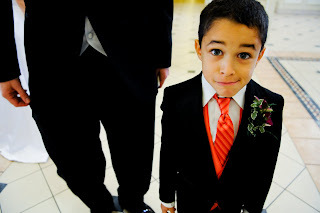 He had been a ring bearer at his uncle’s wedding and loved it, and knew that was what little boys did in weddings. 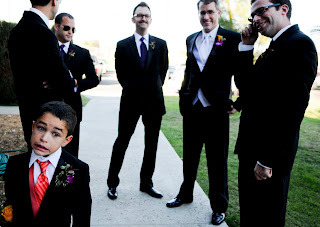 One of my cousin’s had integrated his new 5-year old stepson into the wedding ceremony, giving him a little ring and having them exchange vows as well. I thought this was a little weird, and it seemed even worse when my cousin and his wife eventually divorced, because it seemed like he was divorcing his stepson as well. Socrates wanted him to be the “Best Boy”, like the Best Man, and that is what we called him, but in the end Pickle really wanted to carry the ring and play a more active role in the ceremony, so we let him do that (luckily my mom had picked up a ring bearer pillow on clearance as part of her obsessive wedding purchasing). For the reception, we thought it would be nice for Pickle and me to do a first dance together. We weren’t sure if we should ask him ahead of time...what if he said no, or said yes but then psyched himself out about it and backed out at the last minute? In the end we didn’t ask him. 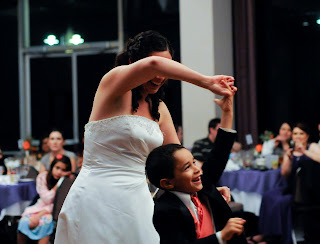 After all the other first dances, “Upside Down” from the Curious George movie (one of his favorites) started playing, and I asked him if he wanted to dance. He said yes very excitedly (which may have had something to do with the ten glasses of punch he had already consumed) and up we went. Halfway through I motioned Socrates on to the floor and we finished the dance as a family, which was really wonderful and sweet. 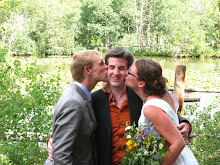 One of the big planning issues was whether to have a babysitter at the wedding. My family is huge and traditionally Mexican, and everyone takes care of everyone else; no one would ever worry that the children weren’t being watched by someone. But this time the kid belonged to the bride and groom, and we worried about inconveniencing our guests by forcing them to watch him. In the end we didn’t get a babysitter, and it worked out fine...Pickle danced with everyone, and hung out with family, friends, and the photographer. And when the sugar crash from those ten glasses of punch hit and he fell asleep on a couch by the restrooms, it provided a quiet getaway for anyone looking for a break from the party. They would “go check on Pickle” and join the quiet group sitting and talking. A huge thank you to Sanyamakadi for sharing her insights with 2000 Dollar Wedding kindred spirits! If you have an idea for a guest post you would like to write, please send me an e-mail!